This was first issued as A22 (Fanfare 19:2), an early example of the partnership of Jill Feldman and Kees Boeke, who went on, even before the death of Arcana’s Michel Bernstein, to form their own label (Olive) while growing olives in Tuscany. 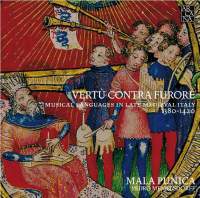 The other vocalist here is Giuseppe Maletto, who continued to collaborate with the first two in the ensemble Cantica Symphonia before they went their separate ways. The new package is even more elegant than the original, with a larger booklet (same contents). The texts and translations are larger and in parallel columns, something I suggested in my review. Antonio Zacara da Teramo is now correctly identified (no longer Magister Zacharias). The contents, ballate of the stilnovo in Italy from 1380 to 1415, were poorly represented on records when this was new. Hardly anything has changed except for Ciconia’s Merçé o morte, which Feldman sings again on Trecento (30:5), so this is still an unusual and rewarding program. If you missed it earlier, the new package makes this even more attractive.